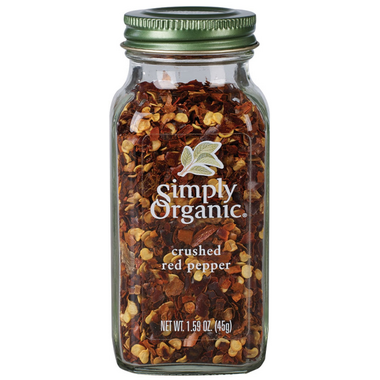 Simply Organic® Crushed Chili Peppers add lively heat to sauces, pizzas and grilled foods. The heat also pairs well with the creamy textures of cheese sauce or creamed soups. Remember, a little pinch of crushed red peppers goes a long way. I love hot and spicy and so this product hits the spot! Love it! This stuff was perfect. I love it on everything, especially with some cayenne on my eggs. Didn't really like the taste of these... they looked great in the bottle (not a lot of dust at the bottom) but tasted kind of musky and don't really add a lot of heat. Disappointing. Unfortunately the crushed red pepper had no heat to it at all - could eat them out of your hand and barely taste anything - have never encountered this before and was surprised because I swear by all the other Simply Organic Products we use. I use these a lot to add flavour and love the fact that they're organic. I have several spices from Simply Organic and have never been disappointed. Bright colour and just the right amount of snap! A great seasoning to use when you want a little extra heat, it's well-packaged and certified organic. You can tell that it's fresh from the bright colour and potent flavour of the flakes. The glass bottle is also great to reuse once empty as the stickers come off cleanly. Great product!